Home #BusinessStrategies #ContentMarketing Digital resurrection - No. 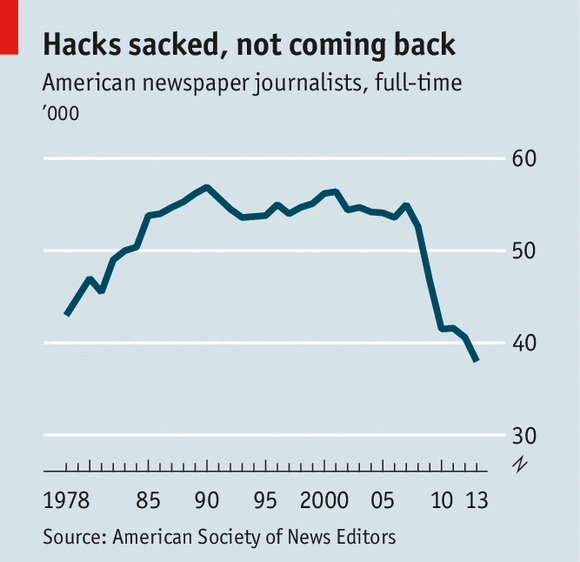 of Newspaper Journalists is dropping! Digital resurrection - No. of Newspaper Journalists is dropping! With the commoditization of technologies and explosive advancement of internet, social media and smart device, it is no surprise to anyone that the large part of the media's job functions will be replaced by machines and software. As a person who has moved from the IT industry into the print media and directory business, I saw this coming years ago. But the real tipping point was reached when smart phone like iPhone and Android and Social Media has gained traction. If you look at the chart, the number of full time newspaper journalists start dropping around 2007 which was the year iPhone was launched. 2007 also was the year that everybody started talking about Facebook. What's coming ahead is that most headcounts for the "Ordinary Jobs" of just pushing news around with not much value added will be gone and replaced by average internet users on Social Media. The number of news media company will explode. The real jobs will fall into the investigative or long-form narratives journalism will still be there.